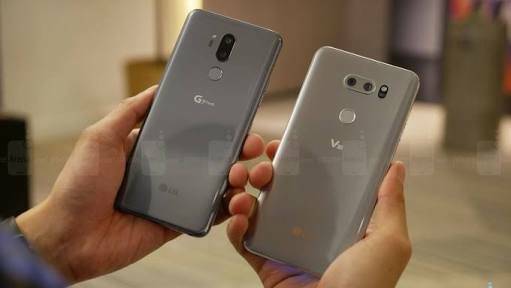 LG G7 ThinQ VS LG V30: 2018 vs 2017 LG flagships. Earlier this year, it looked like we won’t be getting anything new from LG for the first half of the year. Well, the South Korean company are back with the latest flagship called the LG G7 ThinQ. It’s a high-end smartphone that would challenge phones like Samsung Galaxy S9, iPhone X, Huawei P20 Pro, Google Pixel 2 and the likes. The LG G7 ThinQ is said to succeed the LG G6, which was released in February 2017. The LG G6 is a mid-range smartphone, and it’s beginning to look like LG won’t focus much on that segment this year. Going against this new beauty from the South Korean company will be their 2017’s flagship the LG V30. The LG V30 was released in August 2017 and it was the company front-runner till now. But is the LG V30 ready to surrender to the new LG G7 ThinQ? Well, it all depends on what the LG G7 ThinQ is bringing to the table. So stay with me, while we find that out. Looking at both phones you can tell they were manufactured by the same company. First difference is the top notch in the LG G7 ThinQ, which is missing in the LG V30. The build material of the LG G7 ThinQ and LG V30 is the same. They’re both made with front and back Corning gorilla glass 5. And aluminum frame separating the front glass from the back glass. Both smartphones are water and dust resistant with a certified IP68 rating, which means they can last up to 30 minutes in a 1.5metres depth of water. The LG V30 measures 151.7 x 75.4 x 7.3 mm and weighs 158 grams. While the LG G7 ThinQ measures 153.2 x 71.9 x 7.9 mm and weighs 162 grams. The LG G7 ThinQ and LG V30 feature a dual rear camera that is aligned in the center. The dual rear camera of the LG V30 is in a horizontal position. While the dual rear camera of the LG G7 ThinQ is in a vertical position. Below their dual rear camera is the fingerprint sensor. The LG V30 is available in five body colors; Aurora Black, Cloud Silver, Moroccan Blue, Lavender Violet and Raspberry Rose. While the LG G7 ThinQ is available in four body colors; New Platinum Gray, New Aurora Black, New Moroccan Blue and Raspberry Rose. Shame the LG G7 ThinQ doesn’t feature AMOLED screen. According to LG, they are reserving the OLED screen for their V-series. The LG G7 ThinQ sports a notch at the top with no bezel making the display more bigger. The G7 ThinQ houses a 6.1 inch IPS LCD touchscreen that stretches up to a screen-to-body ratio of 82.6%. The display of the G7 ThinQ has a 19.5:9 aspect ratio with 1440 x 3120 pixels resolution and 564 PPI density. Despite not featuring an OLED screen, we can still expect a bright display from the G7 ThinQ. The display of the LG G7 ThinQ is protected by Corning gorilla glass 5. The LG V30’s display is also protected by Corning gorilla glass 5. The display which has an 18:9 aspect ratio, sports a 6.0-inch P-OLED touchscreen. The LG V30 houses a display resolution of 1440 x 2880 pixels with 537 PPI density. If you are a fan of OLED touchscreen, it means you have to stick with the V-series. On paper, the camera quality of the LG G7 ThinQ is more capable to that of the LG V30. The LG G7 ThinQ sports a 16MP f/1.6 aperture primary sensor and 16MP f/1.9 aperture secondary sensor. The dual rear camera of the G7 ThinQ features laser and phase detection autofocus with LED flash. For selfies, the G7 ThinQ has a 8MP f/1.9 shooter. The LG V30’s dual rear camera comes with a 16MP f/1.6 aperture primary sensor and 13MP f/1.9 aperture secondary sensor. Just like the G7 ThinQ, the LG V30 camera features laser and phase detection autofocus with LED flash. The LG V30 comes with a 5MP f/2.2 front-facing camera. The LG G7 ThinQ is powered by the latest Qualcomm Snapdragon 845 chipset, which carries 4-cores at 2.8GHz and 4-cores at 1.7GHz. The graphic is run by Adreno 630 graphics processing unit. While under the hood of the LG V30 is Qualcomm Snapdragon 835 chipset that carries 4-cores clocking at 2.45GHz and 4-cores clocking at 1.9GHz. The Adreno 540 graphics processing unit is in charge of graphics for the LG V30. Running on the LG G7 ThinQ is Android 8.0 Oreo with a planned upgrade toAndroid 9.0 (?). While the LG V30 being a 2017 smartphone, runs on Android 7.1.2 Nougat out of the box. The LG V30 can be upgraded to Android 8.0 Oreo. While the LG V30 comes in a standard 4GB memory with 64GB storage, it’s a different story for the G7 ThinQ. The 4GB memory with 64GB storage will be available for USA and UK users. While the 6GB memory with 128GB storage will be available outside the UK and USA. This is the only category where the LG G7 ThinQ comes out short, which is strange. The LG V30 packs a non-removable Li-Po 3300 mAh battery that charges with USB 3.1 Type-C. While the LG G7 ThinQ comes with a reduced non-removable Li-Po 3000 mAh battery and also charges with USB 3.1 Type-C. The LG V30 supports both fast battery charging and wireless charging. While the LG G7 ThinQ supports fast battery charging. And only the US target LG G7 ThinQ will support wireless charging. The LG V30 cost about $722 (N252,700). While the LG G7 ThinQ cost around $1,006 (N352,100). The price difference between both phones is quite much. But we can’t deny the upgraded features the LG G7 ThinQ came with.